What’s in your travel first aid kit? I’ve traveled the world, which means I’ve gotten sick everywhere from New Zealand to Italy. Travel is rough on the body, and finding familiar medications abroad is tough. 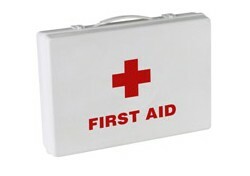 I always pack a first aid kit of over-the-counter drugs just in case an illness or injury strikes. Here are my suggestions for your own kit. Pain medication, such as ibuprofen or Tylenol. A decongestant, such as Sudafed. Head colds can linger, so take enough pills for several days of doses. Allergy medication, such as Benadryl or Claritin. Benadryl contains the same active ingredient as some over-the-counter sleep aids, so it can serve double duty. Remedies for stomach troubles, such as Pepto-Bismol or Tums. If you’re going to be eating exotic food, pack extra. Adhesive bandages. If you’re really klutzy or planning adventurous activities, you might also want to pack gauze and Neosporin or an Ace bandage. Feminine products, such as tampons, pads, or yeast infection treatments. These are not problems you’ll want to explain to a foreign male pharmacist. Aloe vera ointment or another lotion for soothing sunburns. Seasickness medication, if you’ll be traveling by water. Options can include pills, skin patches, ginger candy, or wristbands. Small packs of tissues. Be prepared for sudden sneezes, as well as sticky hands or bathrooms out of toilet paper. In addition, always consult a doctor before exotic travel to determine if you need preventive inoculations or prescriptions for anti-malarial, altitude-sickness, or other medications.